When it comes to New Year resolutions, paying down debt — along with other financial goals — is often on the radar. Chances are that you’ve had the idea to use demolishing your debt as one of your own New Year resolutions at some point in the past. However, actually following through can be difficult, and it doesn’t always pan out as you would like. As you gear up for a brand new year, consider making a goal to pay down as much debt as possible. But don’t do it without first considering your approach. One of your first jobs when deciding how you will pay down your debt is to figure out which debt should be targeted first. Not all debt is created equal, and not all debt is going to cost you the same amount of money or provide you with the same benefit when you pay it off quickly. Chances are that you won’t be able to pay off all of your debt in one year. You may not even be able to realistically expect to pay off all of one kind of debt in the course of the next 12 months. But that doesn’t mean that you shouldn’t demolish what debt you can. Interest rate: The main consideration when figuring out which debt to attack first is the interest rate. Higher rate debt will be more detrimental to your finances the longer you carry it. As a result, it makes sense to start with high rate debt, like credit cards. Tax deduction: You should also focus on debt that doesn’t come with a tax break. You can receive a tax deduction for the interest you pay on some types of debt. Your student loans and your mortgage are tax-deductible, so it doesn’t make sense to focus on these loans when you still carry balances on your credit cards or have an auto loan. While this debt is still debt, and will cost you, it won’t cost you as much. You have a little more breathing room. Amount owed: Don’t forget to consider what you owe. If you want a big “win” for demolishing your debt, see if you can start with a loan that has a lower balance. You can choose two or three loans, if that makes sense. But focus on paying down manageable amounts, and you will be more likely to succeed in the long run. You don’t have to be done in one year. Just decide on one loan to target, and get started with it. Once you make that choice and concentrate your efforts, you’ll be surprised at how much progress you can make. Without taking specific action, your nebulous goal to “pay down debt” won’t turn out well. 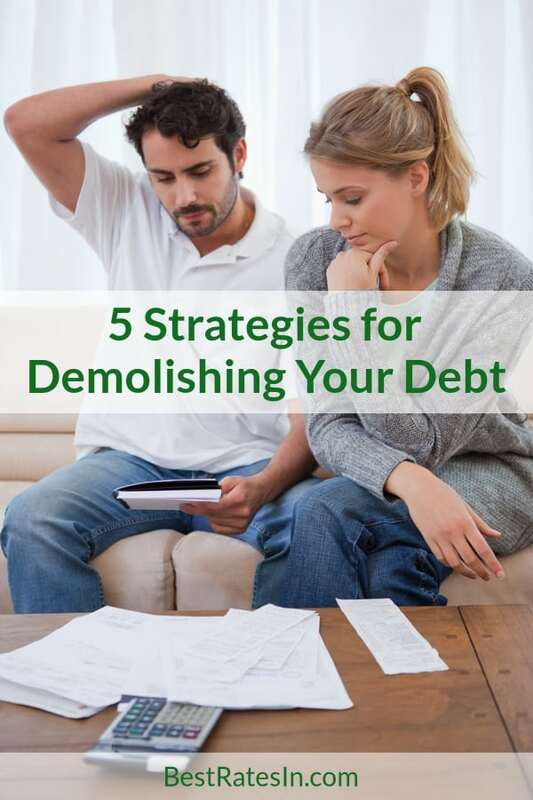 Instead, figure out exactly how much you can put toward demolishing your debt each month. First, see how much money you have available to make extra debt payments. Next, acknowledge that you can probably do better and look for additional room in your budget. Cut expenses: With this approach, you reduce what you spend each month. You might look for ways to save money on groceries or reduce the power bill. You can take the money you save and then use it to pay down debt with the help of a snowball, avalanche, or snowflake strategy. Make more money: Another option is to make more money. Look for other sources of income that can help you boost the amount that you put toward debt reduction each month. Your best results will come from combining the two strategies. Cutting out unnecessary expenses and making more money will put you well on the path toward demolishing your debt at a faster pace. Be realistic about what you can add to your debt paydown efforts, and then make it a point to be consistent in your efforts. One of the things you need to do is make sure that paying down your debt remains a priority. When making your budget, make sure that you prioritize your extra debt payments. Put those at the head of the list of things you need to spend on and make those payments first. Too often, we make our debt payments after we’ve paid for other things — including splurging on entertainment. Don’t make your debt an afterthought. It should be the first thing you spend your money on each month if you are serious about getting rid of it. If you have gone through the steps of figuring out which debt to focus on first, and if you have taken the time to make a plan to increase the amount of money you put toward paying off your debt, you shouldn’t have a problem sticking to your plan. The only exception is when you run into an actual emergency that requires you to divert some of your money away from debt repayment and toward fixing the emergency. However, as long as there isn’t a true emergency, you should make sure that your debt paydown is a true priority. Don’t let other things get in the way. Use automatic transfers to help you make regular payments on your debt so that you aren’t tempted to use that money for other things first. One of the surest routes to failure is giving up because you don’t have a perfect path to paying down your debt. We often think that if we can’t accomplish something grand, it isn’t worth doing. We hear stories of people paying off $50,000 of debt in one year. That’s admirable, and might be nice to be able to do. However, you don’t necessarily have to pay off that much. Maybe it really only makes sense for you to focus on paying off a credit card with a balance of $8,000 this year. When you get caught up in other people’s stories, you forget that you are a real person too and that you have your own unique goals. Don’t give up just because you can’t do what someone else does. Instead of giving up, break down your goal into manageable, bite-sized pieces. If you have $13,000 in credit card debt, a $4,000 car loan, and $35,000 in student loans, don’t assume that all is lost because you can’t make a sweeping gesture by paying everything off at once. Break down your goal so that it’s manageable. In this case, it might make sense to start with the $13,000 in credit card debt. If you know that you can’t get it all paid off at once, focus on one credit card. Instead of saying you have to pay off all $13,000 this year, start by focusing on the $5,000 card. Still make your payments on your other loans, but put your extra efforts into just one card. Don’t get hung up on that card, either. If it doesn’t look like you will make it one year, keep moving forward anyway. Demolishing your debt isn’t about getting it all done at once; the most important thing is that you move forward, even if you feel like you’re moving too slow. Break it down so it’s manageable, make the effort, and then keep going. Celebrate your progress and keep moving forward. Finally, do what you can to increase the amount you put toward your debt paydown. Demolishing your debt becomes even easier when you make the effort to increase the amount you put toward your debt each month. Start with your baseline, but look for ways to add even more. One of the most effective strategies for paying down your debt quickly is to use the debt snowflake. With this method, whenever you find unexpected money, no matter how small the amount seems to be, you make an extra debt payment. Whether you saved $10 by using smart shopping strategies at the grocery store, or whether you canceled your $50-per-month gym membership, put that money toward your debt repayment. This will be most effective if you can turn your extra payment into a monthly effort. One-time debt reductions work, but monthly commitments are the best. Look for ways to get extra money, whether you sell something on eBay or pick up an extra shift. All of that extra should go toward demolishing your debt. If you get into a mindset where that money is automatically earmarked for debt repayment. This might be one of the most powerful things you can do since it automatically assumes that you will use your money to get rid of debt, no matter how insignificant the amount seems. The bottom line is that every dollar of debt you have is costing you over time. You might not think it’s worth it to put a small amount toward debt pay down, but if you keep putting those amounts toward your efforts, and you look for ways to increase what you put toward paydown at every opportunity, you will eventually be surprised at how effective you can be at demolishing your debt this year.